The next RS show I have tickets to is a month from tonight. It will be my 11th RS concert (my fifth since March 2015, there was a 15-year hiatus before that). I rarely watch movies more than once (“The Wizard of Oz” and “Grease” being among the exceptions) or read books more than once, but when it comes to RS, I just can’t seem to resist attempting to get there if it’s somewhat financially in reach. I’ve gone to Vegas for shows, but beyond that I’ve stayed within state lines. Anyway, I’m sure I’m not alone in my countdown-to-a-show mentality. But thinking about that got me to thinking about how different it must be for the person on the other end – in this case, RS. Since he does so many shows a year, is each one just another “day at the office” for him? Does it become routine to wake up, go the airport, hope to avoid the TMZ crew, go through the TSA checkpoint, perhaps sign a few autographs or snap a couple pictures with those who recognize him/are brave enough to approach him, fly across the country, do a radio interview, do the soundcheck, sign autographs/take photos, hear words of adoration from women unable to speak in complete sentences around him (or was that just me? ), do the show, do the meet and greet, sign more autographs/take more photos, hear more words of adoration from incoherent fans (I think I mumbled something, but not sure what) have a drink/late-night dinner, go to sleep, and the next day do it all again? 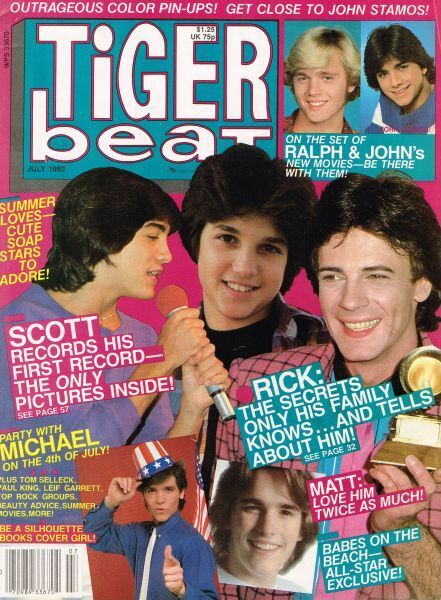 Checking the magazine stand at the neighborhood drugstore to see if the current issue of Tiger Beat, 16 Magazine or Bop was there so I could add another Rick Springfield poster to my wall. Taking numerous babysitting jobs for families who had cable so I could watch MTV once the kids were in bed in hopes that a Rick Springfield video would come on. Camping out overnight in line at the local mall with friends to buy tickets for a Rick Springfield concert. Locking my bedroom door with a “Taping” sign taped outside then listening to Casey Kasem’s Top 40 countdown with a microphone plugged into a cassette tape recorder, ready to tape certain songs off the radio. Hoping to meet RS after the concert, waiting for a glimpse after the house lights come on but after watching “Live and Kickin'” realizing that he was likely whisked away in a limo right after the encore and feeling incredibly disappointed. Finding videos and interviews online that I can watch at home whenever I want. Finding many RS songs from his past 17 albums online and listen to them at any time; and usually finding the lyrics, too. Waiting for concert tickets to go on sale then buy them at my computer the second they go on sale and print them out – with the whole process taking less than five minutes. Having the opportunity to purchase a sound check pass before the show or a meet and greet opportunity after the show. Keeping up with his life on a daily basis – at least his touring/acting life – through Facebook, Twitter and online interviews. Watching him perform live in concert at a venue across the country nearly every night of his tour – both through a live-stream on his Facebook page and through concert-attendees’ phones via Periscope. How about a 3D live-stream concert?